More than 70 APPLE SNACKS AND COOKING IDEAS! 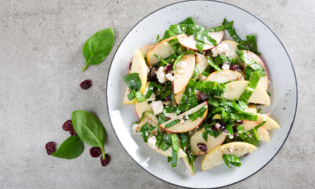 If you are looking to turn those freshly picked apples into some apple snack or if you need some apple recipe ideas for kids, look no further. Cooking with kids is one of the greatest thing you can do with them! Cooking is Science, Literacy, Math and Fun all rolled into one! Do it often…On this page you can choose from Apple recipes of Dips, Spreads, Snacks, Crock-Pot, Novelty, Microwave, On a Stick, and more! 1. BAKED APPLES IN A CROCK POT! Mix sugar, raisins and cinnamon. Stuff apples with sugar mixture and dot them with butter. Pour water into cooker. Add apples. Cook on low 7 to 8 hours. Close lid, leaving one corner of lid open to allow steam to escape. Using a hand blender or potato masher, blend to desired consistency. Serve hot immediately or chill for later use. Have adult core apples or show child how to core apples with an apple corer. Child can place apples in microwave safe dish. In each apple add 1 tablespoon of butter, 1 Tablespoon of brown sugar and sprinkle with cinnamon. Add a little water to the bottom of the dish. Don’t forget to use pot holders to remove dish from microwave. Let apples sit for a few minutes before eating. Have children crumble 9 cookies in the bottom of dish. Open and pour the can of pie filling; spread evenly. Crumble the other 9 cookies on top. Cover the top lightly with Saran wrap type product and put it in microwave for 5 minutes on high. Allow to cool before serving. Place the tortilla on a plate and sprinkle 2 tbsp cheddar cheese on 1 half of the tortilla. Place the apple pieces over the cheese. Then sprinkle 2 tbsp cheese over the apple pieces. Fold the tortilla over the filling. Microwave on high, for about 1 minute. Cut the tortilla in half or thirds and serve. NOTE: Be sure to let these cool awhile. The cheese in the tortillas stays HOT for a few minutes! 1. Cut apple into 8 slices. Spread 4 of the slices with a small amount of peanut butter. 2. Insert raisins between the apple slices for “teeth”. 3. Top the apple slices with another apple slice. Peel, core, and cut apples into rings. Dip into salted water for 15 minutes. Dry for two weeks. Enjoy! You can make raisins from grapes the same way. Turn the apple on its side. Insert one end of a toothpick into a gumdrop and stick the other end into the bottom of the apple core to form a snout. Break toothpicks in half and affix four gumdrops as feet. Set clove nostrils in the nose and clove eyes above the snout. Twist off the stem, poke a hole with a toothpick, and insert an inch-long piece of shoestring licorice into the hole to make a tail. Last, cut a piece of fruit leather into a rectangle measuring 1 by 1/2 inch, then cut again on the diagonal to form two equal-size triangles. Affix upright triangles with small pieces of toothpick to create ears, and then bend over the upper portion of each triangle to cover the spot where the toothpick shows. 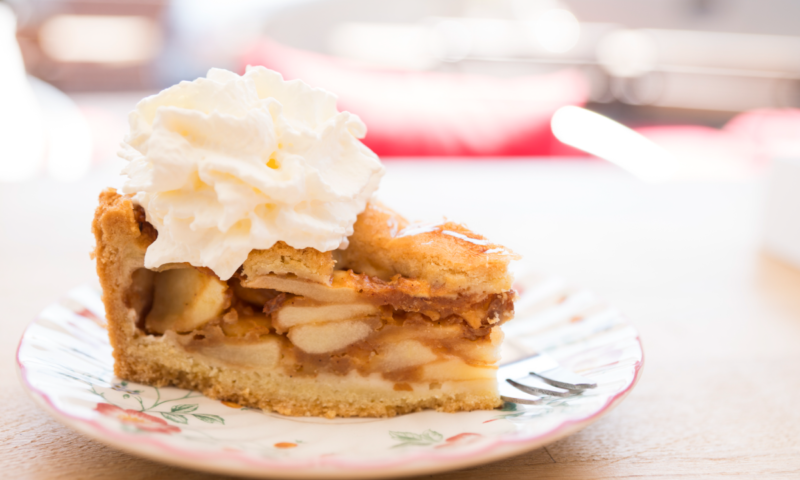 TIP: If you wish to serve from baking dish–scatter gummy worms in/out/and under the apples. This recipe is delicious as a dessert without making it a ‘gross type’ dish. Just omit the gummy worms and serve with ice-cream or whipped topping! Slice round pieces of apples. Cover top with peanut butter. Make facial features as desired using a variety of raisins, chocolate chips, marshmallows, and M & M’s. Cut apple into four quarters, starting at the stem. Remove the core by cutting away to leave a flat surface on the apple quarter. Be careful not to cut too much of the edible portion of the apple away. Drop and slightly spread the peanut butter on apple quarters. Mix together the raisins and dried cranberries then sprinkle on peanut butter. Cut the apples into wedges or rings and spread thinly with peanut butter or cream cheese. Sprinkle a few raisins over, and enjoy. 1. Combine tuna, apple, yogurt, mustard, and honey. 2. Spread 1/2 cup mixture on 3 bread slices. 3. Top each with lettuce leaf and remaining bread. 4. Place on cutting board. 5. Cut sandwiches in half. Core and slice an apple into thin slices. Spread peanut butter over one slice of bread–making sure bread slice is covered to the edges. Place apple slices over the peanut butter in a single layer. Top with another slice of bread and cut in half. Over medium-high heat, melt butter in a non-stick saucepan. Add entire bag of marshmallows to the pot. Stir constantly until all of the marshmallows have melted. Remove from heat. Pour entire box of cereal into a large non-stick pot or bowl. Pour marshmallow mixture over the cereal. Stir to completely cover all of the cereal. For Round Apple Crispies: Lightly spray your hands with non-stick cooking spray. Shape cereal mixture into balls. Store in an air tight container or wrap individually in plastic wrap. Refrigerate for at least 2 hours to allow to harden slightly. For Thick Apple Crispy Bars: Press cereal mixture in a lightly greased 9 x 13 pan. Cover with plastic wrap; refrigerate for at least 2 hours to allow bars to harden slightly before cutting. Tip: To ensure easy cutting, spray your knife with non-stick cooking spray. This will prevent the knife from sticking to the marshmallow. Apples MUST be dry and room temp. Place Popsicle sticks in stems of large apples. Adult- When caramel is melted, put the apple on a stick in crock pot; make sure it’s totally covered. Let it drip; place on wax paper on a paper plate. Decorate with choice of colored sprinkles, nuts, m&m’s, seasonal edible decorations, chocolate chips, peanut butter chips, Reese pieces etc. Lift off the paper plate and place on a doily. These are great gifts too! Heat a small saucepan over high heat. Add 3 tablespoons water and the Caramels. Reduce the heat to low. Stir the caramels frequently until they are completely melted. While the caramels are melting, pull the stems out of the apples and cut a thin slice from the bottoms so they have a flat surface to stand on. Insert a cinnamon stick into the top of each apple. Put the vanilla wafers into a plastic bag and coarsely crush them. Add the crumbs into a bowl and mix in the cinnamon. Dip each apple into the melted caramel, making sure to get it completely coated. Put the coated apples onto a cookie sheet lined with waxed paper. Refrigerate the caramel apples for 1 to 2 minutes to harden up the caramel. Roll them in the cinnamon-crumb mixture and enjoy! To make a kabob, carefully push a skewer through the ingredients, starting with a piece of apple, then a marshmallow, then banana, then another marshmallow. Repeat with a second skewer. Makes 2 kabobs. 1. Cut apples into bite-size pieces. 2. Stick apple pieces with toothpicks. 3. Dip them in honey and crispy rice cereal. Line tray or baking sheet with wax paper. Insert 1 wooden craft stick into stem end of each apple. MICROWAVE caramels and water in large, microwave-safe bowl on HIGH (100%) power for 2 minutes; stir. Microwave at additional 10- to 20-second intervals, stirring until smooth. DIP each apple in melted caramel; scrape excess caramel from bottoms. Quickly roll bottom half of apples in chopped Butterfinger, then place on prepared tray. Refrigerate for 45 minutes or until set. Store apples in refrigerator in airtight container. Apples are best if they are served the same day as they are prepared. NOTE: If caramel becomes firm, return to microwave oven for 20 to 30 seconds or until dipping consistency. Two (1.5 ounces each) Nestle Cruch Candy Bars may be used in place of Nestle Butterfinger Candy Bars. 1. Insert wooden stick into each washed and dried apple. Cover tray with wax paper. 2. Stir together peanut butter chips and oil in medium microwave-safe bowl. Microwave at MEDIUM (50%) 1-1/2 minutes or until chips are softened. Stir until melted. If necessary, microwave at MEDIUM an additional 15 seconds at a time, stirring after each heating, just until chips are melted when stirred. 3. Stir together powdered sugar and cocoa; gradually add to melted chip mixture, stirring until smooth. Microwave at HIGH 1 minute or until very warm. 4. Dip apples in mixture; twirl to remove excess coating. (If coating becomes too thick, return to microwave for a few seconds or add additional oil 1 teaspoon at a time.) Roll lower half of coated apple in coconut or chopped chips, if desired. Allow to cool on prepared tray. Refrigerate, if desired. 10 to 12 apples. Cut the lollipop sticks in half at an angle (the pointy end will go into the apple pieces easier). With the melon baller, scoop little balls out of the apple. Each ball should have a section of apple peel. Push half of a lollipop stick into the peel of each ball. Pat the apple pieces dry. Melt the chips according to the package directions. Dip and swirl the mini apples in the melted chips, then roll the apples in nuts, sprinkles, nonpareils, or coconut, if desired. Place the mini apples in paper candy cups to set. 1. Be sure your apples are washed and VERY dry before dipping. 2. Choose smaller apples to make caramel go further. 3. Use cold apples for dipping to keep the caramel from sliding off. 4. Are these a gift? If in doubt, decorate your apples. If they’re coated in nuts, chocolate, etc., they won’t stick together and can be packaged individually. 5. 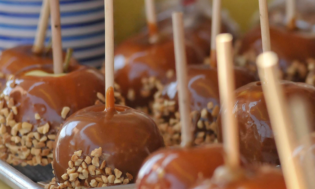 If using store-bought apples, the wax applied to them may keep the caramel from sticking. Scrub apples clean with baking soda, or dip briefly in boiling water to remove the wax. 6. When decorating with larger items, don’t make them too big, as big items tend to be too heavy for the caramel to hold them. 7. Spray wax paper before putting the apples on them. When the caramel dries it will stick to whatever it is touching. And a slightly wet apple is easier to slide off of then a dry piece of wax paper or cupcake liner!!! Raisins, Dried Cranberries, Dried Pineapple, etc. PLACE all ingredients in large saucepan. REMOVE cinnamon sticks and cloves; discard. Serve warm. REMOVE cinnamon sticks Serve warm. Great for the Holidays and winter Days! In a large pot, combine apple cider, cranberry juice, brown sugar, cinnamon sticks, cloves and lemon slices. Bring to a boil, reduce heat, and simmer for 15 to 20 minutes. With a slotted spoon, remove cinnamon, cloves, and lemon slices. Serve hot. Combine all ingredients in 4-quart saucepan. Heat over medium heat, stirring occasionally, until mixture starts to simmer. Reduce heat and simmer 10 minutes. Remove from heat. Remove cinnamon stick. Serve hot. Heat Apple Cider until simmering. Remove from heat and add tea bags. Let steep 2 minutes. Remove tea bags and serve hot. Add each of the ingredients in the order listed to a blender. Combine the frozen yogurt, applesauce, and apple juice in a blender. Add the apple, cinnamon, and nutmeg. For younger kids, you may want to substitute apple juice, which is a bit sweeter than cider. Drop the apple cider ice cubes into a blender or food processor. Pour in the apple cider or water. Blend until slushy, adding more liquid if necessary. Serves 1. Give each child an apple cut in half. Have them sprinkle cinnamon and sugar on them. Using and electric skillet, have each child put two tablespoons of water in the skillet. Each child place their apples in the skillet. Put the lid on the skillet and simmer about 5 minutes or until the apples are soft. The children really like them! You can add whipped cream some ice cream. Peeled and sliced apples are also good this way! Core and quarter unpeeled apples; chop or put in blender with water and vinegar. Cook in a saucepan over low heat until the mixture gets thick and turns brown. Stir occasionally. This will take 2-3 hours (1/4 of that time in a microwave oven). Add sugar and spices and cook for 1/2 hour more. Refrigerate, then spread on toast or muffins. Core and quarter apples; cook with cider in a large heavy saucepan until soft, about 30 minutes. Press through a food mill. Boil gently 30 minutes; stir often. Stir in sugar and spices. Cook and stir over low heat until sugar dissolves. Boil gently stirring often until desired thickness about 1 hour. Pour into hot 1/2 pint jars adjust lids. Process in boiling water bath 10 minutes. (Start counting time after water returns to a boil.) Makes 8 half-pints. Melt about 25 caramel pieces with one tablespoon of water over low-heat. Core apples and slice to about 1” thick. Toss slices in melted caramel and roll in chopped peanuts. (If no allergies) Cool the caramel apple slices on wax paper. Flatten each biscuit into a 6″ round. Place 2 heaping tablespoons of pie filling on each biscuit. Moisten edges of dough with water. Fold over and press edges firmly with a fork to seal. Mix cinnamon and sugar and then sprinkle over top of biscuits. Bake for 15-20 minutes or until golden brown. Also need: Paper plates, plastic utensils and a TOASTER OVEN. You should plan on 1 Granny Smith apple, 4 ounces of low-fat cheddar cheese and 24 whole-grain crackers to serve 12 children. Cut apple into quarters and slice each quarter crosswise into six pieces. Cut cheese into 24 slices, each about 1 inch square. Place 24 crackers on the oven tray and place 1 apple on each cracker. Top the apple with a square of cheese. Bake 3 to 4 minutes or until the cheese begins to melt. Source: Apples in the Classroom, Apples in the Kitchen Texas Child Care, Winter 2006. 1. Core 4 medium-size tart cooking apples. Peel apples if you like. Slice the apples into rings, about 1/4-inch thick. 2. To keep the apple rings from browning, in a large bowl, combine 2 cups cold water and 2 tablespoons lemon juice. Add the apple rings, making sure each apple ring gets coated with the water-lemon mixture. Let stand for 5 minutes. Drain well; pat apple rings dry with paper towels. 3. Preheat oven to 300°F. Lightly coat 2 wire racks with nonstick cooking spray. Arrange the apple rings in a single layer on the wire racks, making sure rings do not touch or overlap. Set each rack on a baking sheet. Bake for 15 minutes. Reverse positions of the baking sheets in the oven, moving the baking sheet from the top oven rack to the bottom oven rack and vice versa. Bake for 15 minutes more. Turn off the oven. Let the apple rings dry in the oven, with the door closed, for 3 hours. Remove from oven. 4. To store, place apple rings in large heavy-duty plastic bag. Close bag. Combine butter, sugar and cinnamon. Pour over cereal. Bake at 350 degrees for 20 minutes. 2. Stir together apples, peanut butter chips, 3/4 cup sugar and 2 tablespoons flour in large bowl. Spread in prepared pan; dot with 2 tablespoons butter. Stir together remaining 1/4 cup sugar, remaining 1/2 cup flour, oats and cinnamon in medium bowl; cut in remaining 4 tablespoons butter until mixture resembles coarse crumbs. Sprinkle oat mixture over apples. 3. Bake 40 to 45 minutes or until apples are tender and edges are bubbly. Cool slightly. Serve warm with whipped cream, if desired. 6 to 8 servings. Peel and chop the apples. Mix well and add the remaining ingredients. Add 6-8 frozen SNICKERS® candy bars which have been crushed or pounded with a rolling pin so they are in big pieces. Fold altogether. Then add a big carton of Cool Whip. Refrigerate until ready to serve. Mix together the Cool Whip and apples. Smash the SNICKERS® bars and add to the salad. Best if you allow to stand for a little while before serving. Cut apples in small pieces. Dice SNICKERS® and add them and Cool Whip. Let chill at least 1 hour. 1. Mix mayonnaise, lemon juice and milk in medium bowl. 2. Stir in apples, celery and nuts. Serve on salad greens. Cover and refrigerate any remaining salad. Directions: Very lightly coat a 9″ x 5″ loaf pan. Soften gelatin in water in a saucepan for 5 minutes. Heat over low heat, stirring constantly until gelatin dissolves. Remove from heat. Add frozen apple juice concentrate; mix well. Pour into pan. Cover and refrigerate. Chill until set, about 2-3 hours. Cut into one inch cubes and serve as a snack. Add one 6 oz can of unsweetened frozen apple juice concentrate. Pour into lightly greased cake pan. Cut into squares when firm. In medium bowl, combine all ingredients. Spoon fruit mixture into individual dishes or paper cups. Freeze until firm. Remove from freezer about 30 minutes before serving. Makes 7 (1/2 cup) servings. Mix rice and applesauce together in a large bowl. Add cinnamon and yogurt. Stir well. Spoon into dishes and serve. Makes six 1/2-cup servings. Unwrap caramels. Combine caramels, butter and milk. Melt together in microwave. Stir occasionally while melting. Slice apples. Dip into warm caramel. Keeps well in refrigerator and just needs to be heated again when serving. Option: Mold mixture into a ball and roll the ball in broken Heath pieces. Mix together the cream cheese and cheddar cheese until well blended. Add remaining ingredients and mix well. Serve with crackers or fresh vegetables. Beat the cream cheese until light and fluffy in a small mixing bowl. Beat in the remaining ingredients until well blended. Refrigerate, covered, for 1 to 2 hours to allow flavors to blend. The spread will keep in the refrigerator for up to one week if covered. Use spread on bagels, crackers or waffles. 1. Combine all the dip ingredients in a bowl, then cover and refrigerate the mixture until chilled. 2. Brush the tortillas with butter, and then cut them into wedges. 3. Arrange the wedges on a greased baking sheet, sprinkle with cinnamon and sugar, and bake at 350° F until golden brown, about 10 minutes. Let them cool before serving. Serves 4 to 6. 2. Mix cream cheese, sugar and cinnamon or spice in medium bowl until well blended. Stir in half of the apples. 3. Spread into pie plate or small casserole dish. Top with remaining apples, Cheddar and nuts. 4. Bake 10 to 12 min. or until heated through. If your looking for a great variety of “Apple Themed Activities.” You’ll find art, games, crafts, diversity and more…Looking for the name and description of a great variety of apples-click here. Bring in LARGE VARIETY of apples. (During peek season there are many-many!) Have the children taste them and see which one they like the best. With older kids you can chart and tally the results. …….You can also do this with applesauce (Flavored vs. Unflavored and also taste test Cider vs. Apple juice. These are fun to make. The tail feathers can be colored mini-marshmallows, gumdrops or ring cereal. This sample uses spice/gum drops. The feet can be whatever you decide–such as gum drops or candy corn. Need: apples, large marshmallows, candy corn and colored toothpicks. 1. 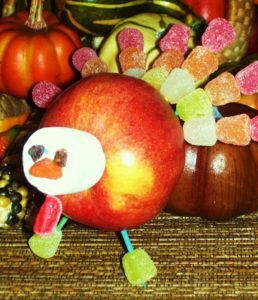 The apple is the body of the turkey. 2. Add colored mini-marshmallows or gum drops to 5 or 6 toothpicks; stick them in one end of the apple, like a fan. 3. Use a toothpick for the neck. Use a marshmallow for a head. Tiny raisin pieces make the eyes and a candy corn for the beak. Personally, I like to eat the spice gum-drops! When you are making food crafts with children, make sure to have a few extra pieces for the kids to munch on! A Jewish friend of mine does this with her family and friends. Take an apple and slice a thin piece from the bottom so that it stands up without support. Cut the top off and core the center out. Fill with honey. 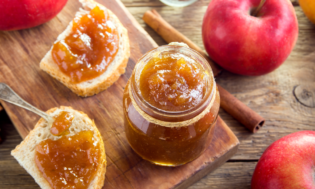 Slice a few more apples… dip the slices in honey for a sweet New Year-Rosh Hashanah. Cover well with water and cook until soft. Stir occasionally to prevent sticking. Cover cranberries with water and cook until very soft (about twenty minutes). Drain. Put apples through food mill or force through colander to remove skins and seeds. Add cranberries, honey, and lemon rind. Note: Depending how tart or sweet you like your sauce, you can add more honey. Source: hanukat.com Wonderful for Jewish Celebration! 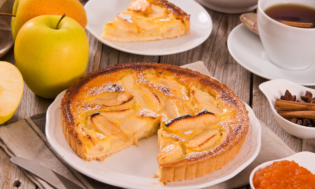 Use some of these great recipes in an Apple Theme. Click here for 2 pages of arts, crafts, games, songs, poems and more!